Skradinski Buk is a massive, clear, natural pool with quite high waterfalls at one end and cascades at the other located in the Krka National Park, in Croatia. 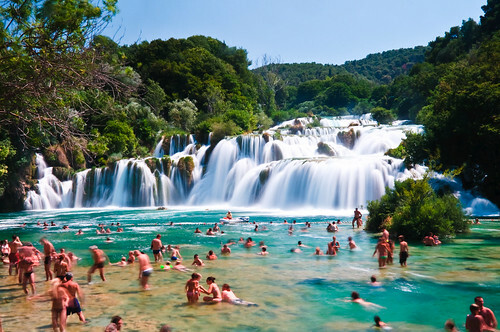 It is the lowest of the three sets of waterfalls formed along the Krka river. In an area 400 m in length and 100 m in width there are 17 waterfalls and the total difference in height between the first and the last falls is 47.7 m. Due to the wealth and variety of geomorphological forms, vegetation, and the various effects caused by the play of light on the whilpools, Skradinski Buk is considered to be one of the most beautiful calcium carbonate waterfalls in Europe. The rate of flow is 43 m³ a second in winter, 18 m³ in summer, with an average of 55 cubic metres a second flowing down Skradinski Buk annually. It is the largest travertine cascade system in Europe.